We and several other groups have provided direct evidence demonstrating an increased production of exosomes in response to hypoxia [31–34] and hypoxia-related conditions such as low pH  and oxidative stress . King et al. exposed breast cancer cell lines to moderate (1% O2) and severe (0.1% O2) hypoxia and found a significant increase in exosome number in a hypoxia-inducible factor (HIF)-1α-dependent manner. Wang et al. further demonstrated that HIF-1α induces exosome release through transactivating the small GTPase RAB22A, which colocalizes with budding vesicles at the surface of breast cancer cells. We showed that oral squamous cell carcinoma (OSCC) cells secreted increased amount of exosomes under hypoxic condition, in which process, HIF-1α and HIF-2α played overlapping roles . In keratinocytes, the proline-rich Akt substrate of 40 kDa (PRAS40) was supposed to be required for hypoxia-induced exosome secretion . The infiltration of tumor-associated macrophages (TAMs) in the TME is correlated with tumor development. Recently, it was reported that hypoxic pancreatic cancer cells could activate macrophages to the M2 phenotype through delivering miR-301a-3p which activates the PTEN/PI3Kγ signaling pathway in recipient macrophages . Consistently, Chen et al. found that hypoxia induces the expression of miR-940 in exosomes derived from epithelial ovarian cancer, which stimulated M2 phenotype polarization. 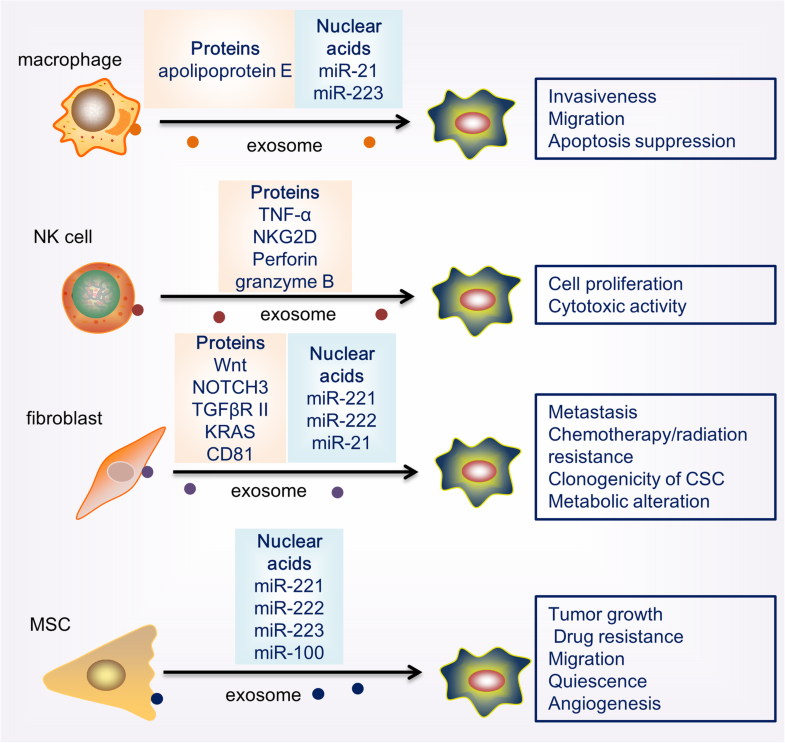 The same group further demonstrated that exosomes induced by hypoxia, in comparison with normoxic exosomes, express higher levels of miR-21-3p, miR-125b-5p, and miR-181d-5p, which induce M2 macrophage polarization . 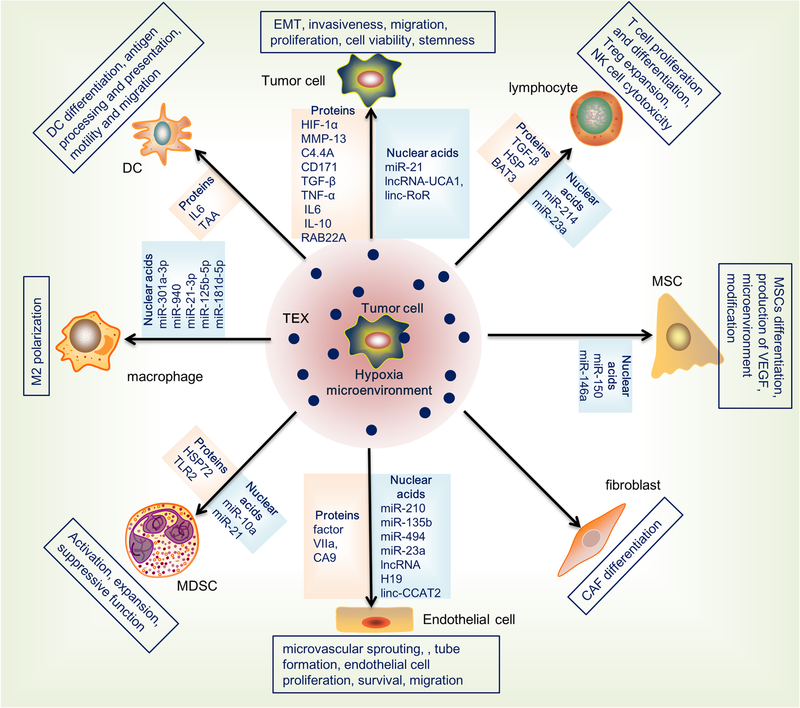 The M2 polarization of macrophages induced by hypoxic TDEs could facilitate the migration, invasion, and proliferation of tumor cells in return [67–69]. These results suggest that hypoxic pressure on tumor cell alters the miRNA profiles of TDEs, which could regulate the macrophage differentiation and function on tumor cells in a feedback loop.